Patio’s Tiki Bar and Grill is a relative new comer to the Grand Strand and in a short period of time has become a huge success. Located on the beautiful Intracoastal Waterway it offers a unique setting and wonderful food, cocktails, and entertainment. It is almost impossible not to have a great time at Patio’s. 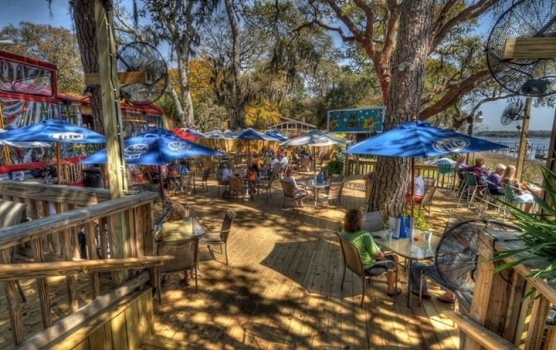 Nestled under a beautiful canopy of oak trees bordering the waterway, Patio’s is a wonderful place to enjoy a meal or cocktails. Patio’s offers indoor seating or a huge deck that offers open or covered seating. The view is gorgeous. The variety of food is simply gigantic, offering everything from appetizers and salads, wraps, unbelievable sandwiches of all kinds, and delicious deserts. New on the menu this year which has been a huge success is the fresh sushi, sashimi, and an outstanding variety of specialty rolls. Patio’s offers live entertainment on the deck daily, beginning at 4:30 except for Sunday when the entertainment begins at 4:00.